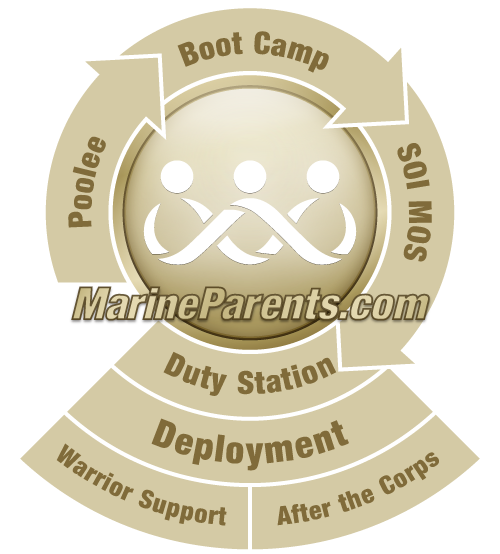 If you are the parent of a combat Marine who is struggling with reintegration, please contact us. We offer education and a place to connect and share with others who understand the helplessness you may be feeling. We have been in touch with far too many veterans and veteran families affected by suicide from suicide attempt survivors to families mourning the unbearable loss of their loved one to suicide. Our Marine Parents Founder said it best: "One suicide is too many. One more suicide is too late." My fears can no longer stand in the way. I'm looking for you, the parent who continued to read this newsletter because your Marine is struggling. Please, if this is you, contact me today to let me know a little about your post 9/11 Marine's struggles with reintegration after combat. Please include information that would be pertinent for me to understand the battalion and time frame deployed. I make no promises, but I can tell you we hope to help by providing you with information and a place to connect and share with others. One suicide is too many; one more suicide is too late. Let's join forces to educate and support one another. Let's help Marie in her wish to prevent Marine suicide. Through our own education and sharing with one another, we can take another step to help our struggling Marines. Take time today to learn the signs of suicide risk and help spread the word about mental health resources. The Veterans Crisis Line reminds us that one small act can make a big difference. We can work together to save lives. You can put a bag full of tools and resources in the hands of a veteran to aid in reintegration after combat deployments. Request a Warrior Reintegration Bag today. If you notice these warning signs, tell a Veteran about the Veterans Crisis Line, or make the call yourself. Call 1-800-273-8255 and Press 1, chat online today at VeteransCrisisLine.net/Chat, or text to 838255 for free, confidential support, 24 hours a day, 7 days a week, 365 days a year. *Information provided by the U.S. Department of Veterans Affairs, Veterans Crisis Line. The American Association of Suicidology provides additional information on the warning signs of suicide. To learn more, click here or visit www.suicidology.org/resources/warning-signs. The VA Mental Health website provides an abundance of information, suicide prevention resources, and educational materials from a Suicide Attempt Survivor Family Resource Guide and information on how to talk to a child about a suicide attempt in your family to links to additional suicide prevention organizations like the American Foundation for Suicide Prevention. To learn more, click here or visit www.mentalhealth.va.gov/index.asp. Militarymentalhealth.org was created by the Military Pathways program and the Department of Defense. Military Pathways provides free, anonymous mental health and alcohol self-assessments for family members and service personnel in all branches including the National Guard and Reserve. For the Militarymentalhealth.org anonymous mental health self-assessment, click here or visit www.militarymentalhealth.org. Vets Prevail is an online resource provided by the U.S. Department of Veterans Affairs (VA) that was built in collaboration with the Veterans Health Administration, the National Science Foundation, and leading mental health researchers and clinicians. Vets Prevail is an innovative new online mental health tool that is tailored specifically to today's Veterans. To learn more, click here or visit https://www.vetsprevail.org. afterdeployment (AD) provides self-care solutions targeting post-traumatic stress, depression, and other behavioral health challenges commonly faced after a deployment. For the suicide prevention portion of the afterdployment website, including a Suicide Prevention Workbook, click here or visit afterdeployment.t2.health.mil/topics-suicide-prevention. For a list of national organizations and federal agencies with information on suicide prevention, click here to view a list provided by the Suicide Prevention Resource Center or visit www.sprc.org/basics/national-organizations. The Senate bill calls for the Department of Veterans Affairs to create a website that will serve as a one-stop source of information on mental health services provided by the VA, for the VA to address a shortage of mental health care experts by allowing it (the VA) to recruit experts through a student loan repayment pilot program, and to extend the amount of time veterans have to seek mental health care services at VA to better address conditions such as Post Traumatic Stress. The bill also calls for an evaluation of all VA mental health care and suicide prevention practices to determine what is working and make recommendations on what is not. It also calls for the VA to establish a new peer support program designed to help service members who are leaving the military access VA mental health services. The House bill calls for the same actions to be taken on the part of the VA, as well as for the Secretary of Veterans Affairs to arrange for an independent third party evaluation, to be conducted by September 30, 2018, and each fiscal year thereafter, of the VA's mental health care and suicide prevention programs; and submit a report to Congress, by December 1, 2018, and each year thereafter, containing the most recent evaluations not yet submitted to Congress and any recommendations the Secretary considers appropriate. Additionally, the House bill extends for one year a combat veterans' eligibility for VA hospital care, medical services, and nursing home care for illnesses that have not been medically proven to be attributable to their service, provided they: were discharged or released from active duty between January 1, 2009, and January 1, 2011, and did not enroll to receive such care during the five-year period of eligibility following their discharge. Affected Veterans can advantage of this enhanced enrollment opportunity until February 12, 2016 (when the law ends) by applying for enrollment online at www.va.gov/healthbenefits on the VA's website, on eBenefits at ebenefits.va.gov, by phone at 1-877-222-VETS (8387) Monday through Friday between 8 a.m. and 8 p.m. EST., or by visiting their local VA medical center. To learn more about the story behind the Clay Hunt Suicide Prevention for American Veterans Act or the Clay Hunt SAV Act and the story behind the Marine who inspired the law, you can follow the links below. Remarks from President Barack Obama during the signing of the Clay Hunt SAV Act. VA news and how the Clay Hunt SAV Act will affect benefits for some veterans. Congressional records regarding the Clay Hunt SAV Act.